There are two kinds of bees in this world. First, there are the domestic, managed bees that commercial beekeepers transport by the truckload to pollinate fruit trees, almonds, and other crops around the country. 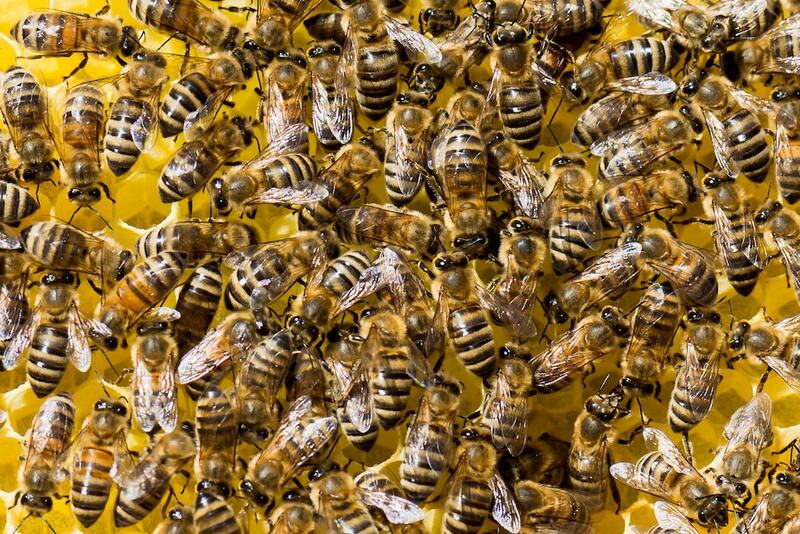 Most of the honey we eat comes from those domestic honeybees. But wild pollinators, including wild bees, are also out busily collecting pollen and fertilizing flowers. Some are tiny. Some are solitary. And they seem to benefit from efforts to save domestic bees from pesticides and other health hazards linked to colony collapse disorder. But are more domestic honeybees and bumblebees always good for wild ones? According to Rachel Mallinger, a pollinator ecologist at the University of Florida, too many domestic bees seem to cause problems for their wild kin. She joins Ira to discuss. Rachel Mallinger is an assistant professor of Pollinator Ecology and Conservation at the University of Florida in Gainesville, Florida. IRA FLATOW: And now it’s time to play Good Thing, Bad Thing. Because every story has a flip side. You know, for years now we’ve been watching this saga of declining bee populations around the world. Whole hives disappearing. The struggle of farmers and commercial beekeepers to keep their colonies alive to pollinate the crops and produce the honey we all like. RACHEL MALLINGER: Hi, thanks for having me. IRA FLATOW: So let’s talk about this. From a wild bee’s perspective, what’s good about domestic bees? RACHEL MALLINGER: Yeah. So I think what’s good about domestic bees, from the perspective of the wild bee, is that it raises awareness of bees and it raises awareness of the importance of pollination. And when we go about– when we go about trying to conserve bees, many of the things we do to help the domestic bees also help wild bees. So whether that’s reducing pesticide use or regulating pesticide use, planting flowers, conserving flowers, all of those things can help both the domestic bees and wild bees. So I think, from the wild bees’ perspective, domestic bees do help raise awareness of bees and bee conservation and increase our awareness of the importance of bees and the role they play in pollination. IRA FLATOW: But there’s a downside, though, for the bees and the wild bees, domesticated bees. RACHEL MALLINGER: Right. Yeah. So the downside is that these domestic bees– first of all, many of them are used outside of their native or natural range, and so they would be considered an exotic species where they’re used. And in general, these domestic bees, whether they’re used in their native range or whether they’re used outside of it as an exotic species, they can compete with wild bees. And so when they’re present in really high densities, they compete for the same flowers. And there’s also research that suggests that they can spread diseases to the wild bees. IRA FLATOW: Yeah. And I follow Tom Seeley’s research on wild bees. He talks all the time about the need to make sure the wild bee population is healthy. RACHEL MALLINGER: Right. Exactly. Yeah. And so we’ve started monitoring diseases, as well as pests and pathogens, and trying to figure out, are these managed bees spreading diseases? In what context? In what ways? And also, what is their competitive effect? How much do they compete with these wild bees? IRA FLATOW: And how much do they? I mean, what are some of the results of this? RACHEL MALLINGER: Yeah. So in terms of competition, some of the results do suggest that they can compete with wild bees and they effect wild bees, but how large of an effect and whether that’s causing any wild bee declines is still fairly unknown. So for example, a study might show that when you have managed bees in an area, you see fewer wild bees on a given plant or flower. Does that mean that the wild bee populations are declining in that area, or does it just mean that they’re choosing to forage on something else? They say, oh, there’s no honey bees over here, we’re going to go forage over here, and they’re just fine. So we do see that there’s evidence of competition, but how much of an effect does that have? Is that causing wild declines? That all remains a bit unknown. IRA FLATOW: Well, is there any way we can protect the wild bees, while still relying on the domestic bees? RACHEL MALLINGER: Yeah. Definitely. So I think one thing people can do is support large scale conservation. So conserving parks, conserving native, natural lands, donating to conservation organizations, places, and people in organizations that are relatively natural and native in conserving those. I think people can also do things in their own yards. They can plant flowers. A lot of states will have lists of flowers that are attractive to bees that you can plant. And then reducing pesticide use around your home and in your yard, especially if you’re planting those things that are attractive to bees, you want to be most careful with those. You don’t want to be spraying a flower that is going to attract a bee. So I think there’s those things you can do locally, but then also supporting the large scale conservation. I think land use change– so development and agriculture– are destroying a lot of those natural habitats that the bees rely on. That’s probably one of the biggest factors that could contribute to bee declines. So supporting those natural areas is really important. RACHEL MALLINGER: Exactly. Yeah. It’s a European– the European honey bee is what we have here in the US. So as its name suggests, it’s not native. It’s native to Europe. IRA FLATOW: OK. Thank you. That was great. Thank you, Rachel. Mustangs carry symbolic weight in the minds of Americans. That makes managing their populations tricky.